We regret to inform the ERSA community that our respected and beloved colleague, Professor Gyula Horvath passed away on the 23rd of September. 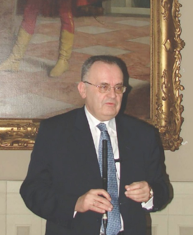 Obituary for Professor Gyula Horvath. Hungarian social science has suffered a great loss with the tragically sudden death of Gyula Horváth. Gyula Horváth was for 15 years Director-General of the Centre for Regional Studies of the Hungarian Academy of Sciences, he was also scientific advisor of the HAS Centre for Economic and Regional Studies, professor of the University of Pécs and Doctor of the Hungarian Academy of Sciences. Gyula Horváth would have been 64 years old on the 4th of October. With his passing we have lost a friend, scientist, professor, establisher of scientific schools and organiser of scientific research who was irreplaceable not only for his immediate fellow workers but also for his city and region and the larger domestic and international scientific community. Gyula Horváth was an internationally acknowledged and leading personality within Hungarian regional science. His research focused on the exploration of spatial processes in Europe, Hungary and the Carpathian Basin. He was an extremely productive scientist and he published his scientific achievements in dozens of monographs, edited volumes, as well as several hundreds of scientific studies in Hungary and abroad. He successfully and frequently obtained research grants both in Hungary and from international sources in order to promote scientific endeavour at the Centre for Regional Studies. His knowledge was also frequently sought by regional development agencies, planning authorities, and several different international expert bodies. He was also a founding figure of modern Hungarian regional studies and established doctoral schools in regional science as well as university educational programmes. The trans-border schools of Hungarian regional science were organised with his assistance. Scientific schools and generations of scholars are thankful for all his support. Gyula Horváth was a central figure in the scientific community. He was the founding president of the Hungarian Regional Science Association, a member of the Kossuth and Széchenyi Award’s Architectural and Regional Development Subcommittee. He was the president of the Committee on Regional Science of the Hungarian Academy of Sciences, member of the Academia Europaea (London), and of the Hungarian Science Abroad Presidential Committee. He was also member of the Executive Board of the Association of European Schools of Planning and the regional policy evaluation committee of the Research and Technological Development Programme of the European Union. He also served on the editorial boards of different domestic and international journals. Besides several other prizes and awards he was granted the Széchenyi Scholarship, the Pro Regio Award, the Award of the Hungarian Academy of Sciences and the Hungarian Government’s Széchenyi Award. His rising scientific career, nomination as the corresponding membership of the HAS and his submitted application for the position of the Director General of the CERS HAS were interrupted by his tragic departure. His colleagues, the domestic and international regional scientific community, and a large community of academics, politicians and civil society actors committed to regionalism and decentralisation are all affected by this loss. The CERS HAS Institute for Regional Studies will always remember him and will make all efforts to implement his vision. His absence is painful, he is irreplaceable and, at the same time, he has provided us much intellectual motivation to continue his work and to further represent the spirit of regionalism. The collective of the HAS Centre for Regional Studies shares the pain of his family.